Venezuela's descent under Bolivarian socialist President and de facto dictator Nicolas Maduro has achieved yet another grim milestone. This time it's the return of polio, on top of other previously eradicated diseases including diphtheria, tuberculosis, measles, and malaria. The return of polio has caught the attention of some in the international press in the past few days, but only one of over a dozen related English stories found in early Monday afternoon Eastern Time Google News searches identified the nation or its leader as socialist. Also as of Monday afternoon, there was no coverage at major U.S. news outlets. 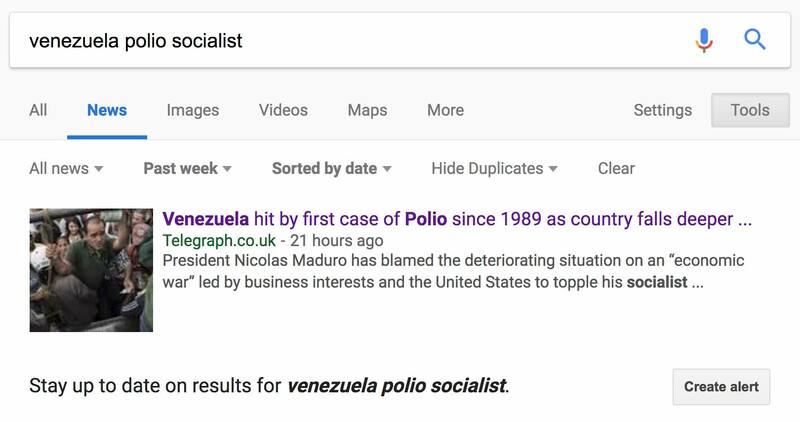 A Google News search on "Venezuela polio" (not in quotes, past week, without duplicates) returned 17 items, a dozen of which were in English. Newsweek, which noted that polio has returned as "the country’s health care system struggles under a nationwide economic crash." Well, what caused the crisis? The Hong Kong Standard, which is "Hong Kong's biggest circulation English daily newspaper."